Get the gorgeous look with this majestic attire and add the elegance in your personality. The attractive blue and magenta party wear saree having georgette pleats and net pallu that is inflated with the rich border embellished with resham & thread work, patches and zari embroidery work. 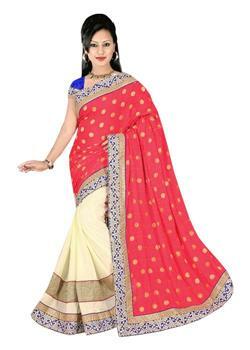 Also the border of pallu is enhanced with floral resham thread work and golden shimmering border.